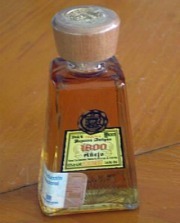 1800 tequila: has Patron met its match? 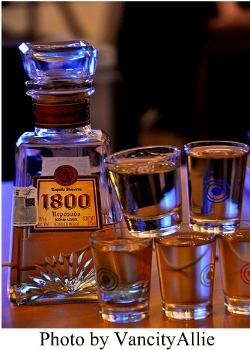 1800 tequila is a Jose Cuervo brand. Its name is a tribute to tequila first being aged in oak barrels. Back in, you guessed it, 1800. It’s imported and distributed by Proximo Spirits, a company based in New Jersey. What brand does 1800 tequila compete against? Check this video out and see if you can figure it out. I don’t know what an Italian Michael Imperioli is doing promoting tequila (shouldn’t it be a Mexican instead? ), but the message’s clear: they’re going after Patron. Will they succeed? That’s your call the next time visit your local liquor store. Aging: 2 weeks in wood barrels. Peppery aroma, sweet agave taste, little harshness from the alcohol, and a sleek bottle design. Decent tequila for tight budgets. Just avoid trying that ridiculous shot top Cuervo brags about. It’s both a marketing disaster and a surefire way to look drunk while spilling tequila all over. 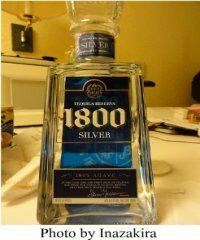 1800 Select Silver is a special kind of tequila. You see, Select Silver is 100 proof. Oh yeah, you’ll be getting a lot of bang for your buck (literally). The flavor turns out smoother than you’d expect from 50% alcohol tequila, since some aged tequila is added to smooth out the flavor (an interesting decision by Jose Cuervo). It has a sweet, citrus flavor and a spicy finish. I’m a blanco aficionado, so this one's my favorite on the list. It gives any and all margarita recipes an extra punch… and it gets you drunk in a heartbeat! A drink best served cold. Aging: 6 months in American and French oak barrels. Unofrtunately, 1800 tequila seems to becomes “un-smooth” as it ages. A strong aroma and powerful alcohol smell might catch you off-balance. Seems to be the most popular 1800 tequila, but I don’t think it’s the best. Aging: 3 years in French oak barrels. Spicy and dry flavor. This, unfortunately, is not a smooth drink. The oak presence overpowers the agave flavor. “Isn’t agave supposed to shine through any tequila?” It normally does, but not in 1800 Anejo. You will find better anejos in the market, but 1800 is somewhat cheaper than other anejos. Better than Patron? Maybe. 1800 is a brand you should consider when drinking on a budget. Quality-wise neither one is a personal favorite.